Never have to repair or replace your roof again. If you are tired of repairing or replacing shingles on your roof, a Decra Stone Coated Steel Roof just may be what you are looking for. 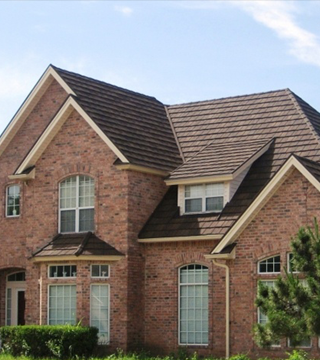 A Decra Roof is the ‘best of the best’ when it comes to roofing products. Todays asphalt shingles are being made at such a rate that the quality is poorer then ever. F-M understands this and wanted to provide a much better option. Asphalt shingles have their place and do their job; shed water. And if you lucky, they may last 15-17 years, regardless of what the warranties state. Shingles start to deteriorate almost instantly. And once the granules start coming off the shingle (and into your gutters), rapid deterioration starts to occur. When one hears “Metal Roofing”, barn metal may come to mind. But a beautiful Decra Metal Roof mimics todays traditional roofing products; Shingles, Hand Split Wood Shake, Clay Tile, Mediterranean Villa Tile. Our highly skilled and trained metal roof installers are full-time employees and are the best in the area. We believe so highly in their craftsmanship that FM Exteriors offers a 100% lifetime workmanship guarantee that when you purchase a Decra roof, you will never experience a leak in your home due to us installing your roof. If you are seriously considering the last roof you will ever need, call us today for a free quote. Energy Efficiency: Metal reflects 70% of the sun’s energy. This minimizes heat retention, and as a result, less heat is transferred into the building’s structure (the attic). Additionally, research done in 1985 by the Florida Solar Energy center showed that metal experiences 34% less heat gain than asphalt shingles. Results also indicated that metal roofing offers an effect similar to R-11 insulation on top of the roof during sunny conditions. Composition: The weather and elements will have to go through eight (8) layers of protection on a Decra Metal Roof to get to your home. Decra roof panels are aluminum-zinc coated, 26 gauge steel, covered with ceramic coated stone granules and finally sealed with an exclusive polymer coating providing a roof that could very well be the last roof for your home. Whether you prefer the look of shingle, tile, slate or wood shake there is a profile to satisfy your homes style. Sustainability: Decra is a durable, long lasting recyclable product. Additionally,Decra is a light weight roofing product meaning it can be installed over existing roofing materials, thereby diverting old materials from landfills. Durable: Decra is a Class 4 Impact Rated roofing product (highest rating) which may qualify homeowners for a discount on their home owner’s policy. Please check with your current insurance policy holder for more details. Wind Resistant: Decra panels are screwed to the roof decking with 1 ¾” screws to give your roof a 120 MPH wind warranty. Peace of Mind: Decra Stone Coated Roofs comes with a limited lifetime warranty. Combined with F-M Exterior’s “Limited LIFETIME WORKMANSHIP WARRANTY” you will have, by far, the most superior, affordable, roofing system available today.